The PCE-320 Phsycrometer is an exceptional product at such a low price. With the PCE-320 psychrometer it is possible to measure climate conditions such as temperature and relative humidity as well as to determine the surface temperature of objects simultaneously by using an external temperature sensor ( included in the delivery) or an infrared measurement. The PCE-320 psychrometer provides additional information relating to dew point ( dew point temperature) and the global humidity temperature. Measurement values can be directly seen on the device' s display; maximum and minimum values can be registered or transfer to a PC or portable computer for further analysis. It will allow for the prevention of fungus in food when being stored and during transportation. The PCE-320 psychrometer is also very useful in the construction industry. Customers frequently complain about not having a tool available that can measure ambient conditions and surface temperature of a wall both inside and outside. The PCE-320 phsychrometer can also be used in the industrial sector and in product development. The device can either be verified in situ using an optional calibration kit or it can be sent away to be calibrated by an accreditted DIN ISO laboratory. We offer the possibility of ISO calibration from factory ( when the device is ordered or as an annual recalibration) . 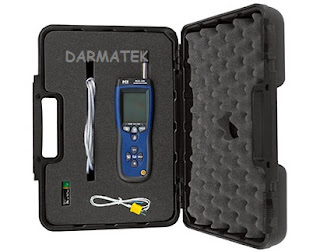 Here is another psychrometer that can also determine dew point and global humidity temperature.